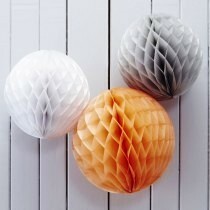 This pack of three honeycomb pom poms would add a splash of colour to any party. Perfect for either a baby shower! The pack consists of one large peach ball (12 inches), one small grey (10 inches) and one small white ball (10 inches).